Although the weather in this region rarely leaves you with the choice, with the sun shining almost all year round, for everything else you would have to be hard pushed not to love the region of Provence-Alps-Côte-d'Azur. With protected sites where nature reigns, such as Écrins National Park, Mercantour National Park and the Gorges du Verdon (Verdon Gorges), the north of the region is popular both in the winter for its skiing resorts, like Serre-Chevalier, but also in the summer for its many hiking and outdoor sports activities. 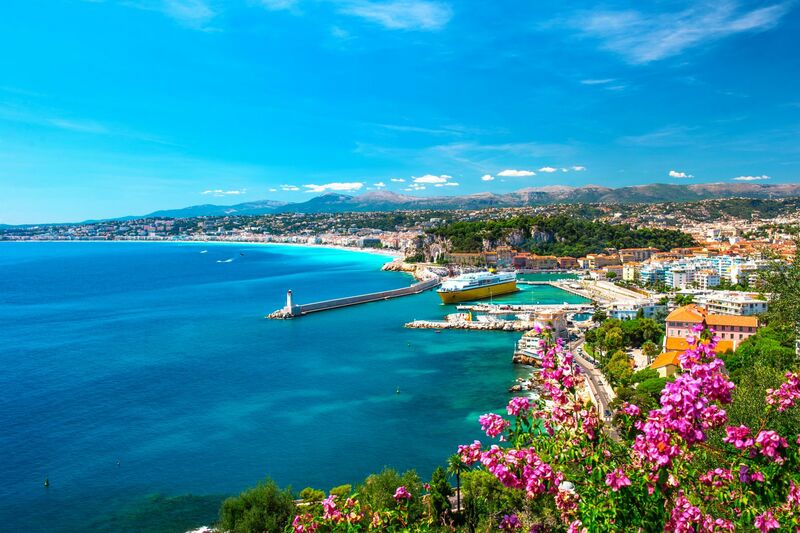 If the words rucksack, flask and walking are, for you, in no way synonymous with the word 'holiday', come to Provence-Alps-Côte-d'Azur to discover some of the great places along the coast that thrive here in the summer. These are, of course, Nice 'La Bella', Cannes 'Perle de la Côte d'Azur'('Pearl of the Côte d'Azur') and the Antibes 'La Phocéenne ('The Phocaean'); names which evoke outings in a convertible with your headscarf blowing in the wind as you wind along the roads of the sunshine coast. With this backdrop as you approach Marseille, images from film scenes mingle with the brushstrokes of painters (Cézanne, Van Gogh) who discovered a whole new palette of colours in the special light that the Côte d'Azur offers. As soon as the Canebière (the historic French high street) comes into view, the dialogues of the French writer Pagnol come to mind, together with the scent of bouillabaisse (traditional fish soup) and pastis (an alcoholic aniseed-flavoured drink). The monuments of the Palais des Papes (Papal Palace), Notre-Dame de la Garde and Arènes d'Arles (Arles Amphitheatre) are well-known symbols of the region, but only make up a small part of its historical buildings. They stand as if to mark the passing time, highlighting the different influences which have coloured the region. From the wild nature of the Camargue to the liveliness of Avignon Festival, the sunrise of Cannes Festival to the sunset on the Lérins Islands, Provence-Alps-Côte-d'Azur is a place full of light which awakens all your senses, but particularly your sense of smell, with the subtle mingling in the air of lavender, olives and the garrigue scrubland. The Provençal word 'bouiabaisso' comes from 'bouille', meaning 'fish', and 'abaisso', meaning 'to remove something from the fire'. Indeed, there are as many different recipes for bouillabaisse as there are chefs, and the choice of ingredients used can be the cause of much lively debate! Having said that, the basic form of the dish remains the same - a fish soup with a spicy saffron sauce (known as 'rouille' - meaning 'rust' -, probably because of its colour), pieces of fish, and served with garlic croutons. The ingredients for fish soup include rockfish (rainbow wrasse, comber, and goby), conger tails, moray eels, crab, and slipper lobster. The 'rouille' sauce that accompanies the soup is made using mayonnaise with garlic, cayenne pepper, sea urchin coral, bread crumbs, and olive oil. The soup contains 'rouille' croutons and rockfish (scorpion fish, weever, sliced conger, red mullet, and John Dory). Whichever recipe you use, one thing's for sure: you'll never find crayfish, bass, or sea bream in it, though you might find a few potatoes thrown in at times. Do bear in mind that some restaurants that are more concerned with lining their pockets than providing a treat for the taste buds offer a very reasonably priced bouillabaisse for under £9. However, the only thing these dishes share in common is their name. Of course, paying a high price is no guarantee of quality, but you can nevertheless expect to pay an average of almost £60 for a good 'bouillabaisse' for two. If you want to be sure that you're trying this dish at its very best, ask the local fishermen which restaurants they work with. Oil, fish, and wine A symphony of colours, flavours, and aromas, Provence is worth the trip for its cuisine alone. A variety of vegetables, olives and oils, seasonings, herbs, and anchovies all feature heavily in the local cuisine, which consists largely of ratatouille, tapenade, 'rouille', 'aïoli' (a kind of garlic mayonnaise), pistou soup, and Niçoise salad, among other things. Meat- and cooked meat-based specialities (lamb chops, rabbit à la provençale, meat stuffings, etc. ), and of course fish specialties, such as 'bouillabaisse' and 'bourride', a Mediterranean seafood stew, have also become essential dishes for appreciating the Provençal life. You'll find the region also has plenty to offer when it comes to dessert, including various mountain honeys and preserves, 'calissons' (almond and marzipan sweets) from Aix, 'berlingots' (hard candy from Carpentras), candied fruits from Apt, and 'câlins' and cakes from Saint-Tropez. Then there is the famous pastis (an alcoholic aniseed-flavoured drink) followed by the grand cru wines (Châteauneuf-du-Pape, Côtes-de-Provence, Rasteau, and Bandol, among others), to be consumed in moderation, of course. Cavaillon melon Cavaillon's association with the melon dates back to the 15th century. The oldest known variety is the slightly oval 'muskmelon', which has a rather greenish skin covered in a somewhat anarchic 'embroidered' effect. In around 1495, the Cantaloupe variety, so-called because it was originally grown in Cantalupo (a popular papal holiday destination just outside Rome) established itself in the then pontifical land of Cavaillon. It quickly became a widespread crop and would survive there until the 20th century. Along with the artichoke and the peach, the melon was considered a rare fruit until the late 18th century. It was a crop that required particular attention, land reserved especially for its cultivation, careful monitoring, and various precautions. The melon was first exported in 1882 and at the time the area devoted to its production took up one fifth of the land used for growing crops. As of 1825, a new variety of smooth-skinned melon was also cultivated here, the variety for which Cavaillon is now renowned and which we know as the Cavaillon melon. News of this new variety soon reached Paris. With a degree of humour and opportunism, Alexandre Dumas himself replied to a request sent to him by the Cavaillon library asking him for a few of his works to help boost their coffers. He said he would agree to their request in exchange for a life annuity of 12 melons a year, an offer which they of course accepted. In 1988, the brotherhood of the Knights of the Order of the Cavaillon Melon was set up to promote and celebrate the fruit. The melon can be prepared in various ways, giving chefs a degree of creative license when it comes to inventing new flavours. It is used in pastries, chocolate, ice cream, sorbets, cakes, bread, and even almond paste, and also goes very well with alcohol, wines, and various aperitifs. Melon-based recipes really do make the mouth water, from Cavaillon melon sorbet with little 'calissons' biscuits to melon soup spiced with basil, and even confit of melon salad with cured ham, among other creations. Dauphinoise cuisine The Dauphinoise cuisine of the Haute-Alpes region will undoubtedly titillate your taste buds with what is actually a rather limited range of dishes, including gratin dauphinois (au gratin sliced potatoes cooked with milk and crème fraîche), Champsaur tart (made using local jam), ravioli (a typical mountain dish), rissoles (a kind of ravioli filled with cabbage, potato, and seasonings), etc. There are very few wines produced here but there are plenty of plant-based local liqueurs from the mountains, including Génépi and Myrtille, among others. Find weekly weather forecasts for Provence-Alpes-Côte d'Azur . Different criteria make it possible to predict with precision the best time of year to go to Provence-Alpes-Côte d'Azur . A comprehensive weather score, made up of temperature indicators, bad weather predictions, sunshine levels and wind speeds, will allow you to choose the activities best suited to the weather conditions and therefore make the most of your holiday in Provence-Alpes-Côte d'Azur . Our journalists' reviews for you 95 hotels France . Take a look at our hotels, their facilities or their value-for-money score according to your departure dates so that we can find the best offer to suit you France . Book a hotel France it's never been so simple ! 10/12/2018 - Nature You've heard of the Grand Canyon, but what about these natural wonders?